The message needs to be, “Fix America’s broken immigration system now.” And the messengers need to be the American people – meaning not just businesses, but everyday citizens. 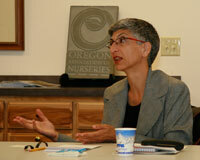 So said Tamar Jacoby, executive director of ImmigrationWorks USA, during a Sept. 8 visit with members of the Coalition for a Working Oregon, a broad-based coalition of 20 employer groups, including OAN. In Jacoby’s experience, nearly all members of Congress are hearing the message from business groups. Most agree that immigration reform is needed to ensure fairness, protect the integrity and clarity of the law, and preserve an adequate workforce for employers. That’s the good news. The bad news is that the most vocal members of the general public are demanding punitive measures rather than comprehensive reform, leaving legislators little encouragement to truly solve the issue. Businesses need to fight back, Jacoby said, by educating the public and demonstrating that a partial, enforcement-only solution harms everyone. “If you make it a two-sided debate for a legislator,” she said, “then he can vote his conscience.” In July, the CWO took a major step in that direction by releasing a study showing that the removal of immigrant workers would cost others their jobs (click on “economic study”), too, hurting Oregon’s economy in the process. “That’s my vision of how this war gets won – by groups like this,” Jacoby told CWO members.